Summer is officially right around the corner and my bikini body is not. I am no stranger to turning my workouts up a notch when that warm weather starts to creep in but learning to count macros has been something I have been interested in. I was looking for someone to tell me exactly how I should be breaking down my macros and why. I believe really strongly that when you know how the food you eat is fueling your body, it's easier to make better lifestyle choices. I have noticed small changes already! Macros 4 lyfe. Going into this summer, I'm coming off a hand injury and definitely needed a little accountability to keep me going. The program provides full body, upper and lower body workout circuits. Each workout is designed to push you and as mentioned above, that's exactly what I need. Do it for the beach, do it for the beach. I love that I have a workout already planned and I just need to show up for myself and follow it. The absolute best part? The workout can be completed either in the gym or at home. Come up with another reason you can't- I dare you. When it comes to dieting, I believe that eating clean should be a lifestyle. Crash diets are horrible for your body and ultimately ineffective. Making consistent good choices in food leads to feeling healthy and strong year round. Not just for summer. 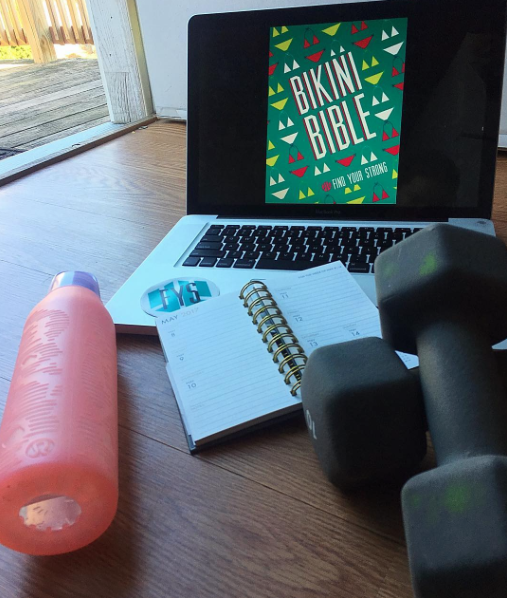 Chelsey, the founder of the program, posts frequently to the Bikini Bible facebook group. These posts are full of tips and recipes for clean eating or finding that perfect sweet-tooth-fix. A few months ago she posted the recipe for a matcha tea latte and it has become one of my favorite afternoon treats! I suggest you join, you can do so here-https://www.facebook.com/groups/bikinibibleprogram/. Stay tuned for my results in a couple of months. I am giving myself 8 weeks and I will post my results.